The Minister for Justice revealed this morning that as many as 30 Irish residents have travelled to take part in the armed conflict. 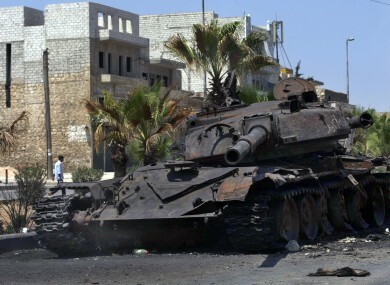 The remains of a destroyed military tank is seen on a street in the town of Hanano in Aleppo, Syria. GARDAÍ ARE MONITORING the ‘foreign fighter phenomenon’ of Irish residents travelling to take part in the conflict in Syria, as well as their potential radicalisation upon their return. The Minister for Justice and Defence Alan Shatter revealed this morning that the government is aware of between 25 and 30 Irish residents having travelled to Syria to take part in the conflict. He was responding to questions from Fianna Fáil TD Brendan Smith, who said it has been estimated that as many as 11,000 people from 70 different countries have travelled to take up arms in the ongoing civil war. “Gardaí will continue to monitor the situation in this area and will take action as necessary,” Minister Shatter said. Shatter echoed the deputy in describing the conflict as a “humanitarian disaster”. He said that units within An Garda Síochana, such as the Garda Racial, Intercultural & Diversity Office, are liaising with minority communities where there might be individuals more “inclined to travel”, to stress that there are more “beneficial ways of taking part in the conflict than by taking up arms”. There is also a concern among Member States that fighters returning to Europe may pose a threat, he said. He said that Ireland is working with other states to decide how best to manage the phenomenon. Email “Gardaí monitoring potential radicalisation of Irish residents in Syrian conflict”. Feedback on “Gardaí monitoring potential radicalisation of Irish residents in Syrian conflict”.